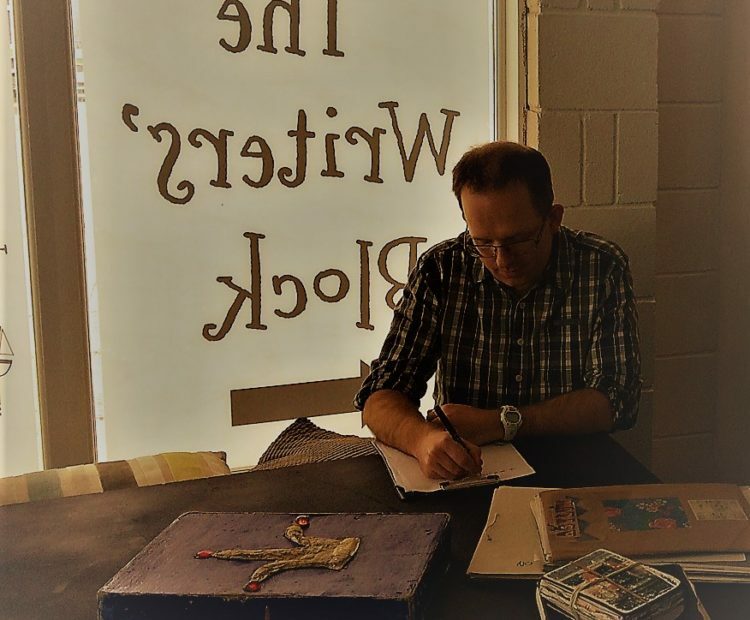 We caught up with Man-booker nominated novelist and one of our very own lecturers, Wyl Menmuir, to talk about The Writers’ Block. He discussed with us his role as Lead Writer and the charity’s effort to secure funding through The People’s Projects to sustain its provision of creative writing sessions for children and young people in Cornwall. How would you define The Writers' Block? The Writers’ Block is an amazing creative writing centre in Pool, Cornwall. We mainly run creative writing sessions for children and young people, but we work with families, adults and other groups too - anyone who wants to develop as a writer. It’s an immersive experience and difficult to sum up, but here goes… One of the main things we do is to help children and young people who might struggle with writing, to gain confidence, new skills and really enjoy writing, perhaps for the first time. The Writers’ Block itself is nothing like a classroom; it has been created by artists and writers together and it's a bit like an Aladdin’s Cave. It’s even got a Narnia-style wardrobe! The children work with professional writers – authors, poets, playwrights – and they leave brimming with ideas and stories, ready to tackle writing back at school or at home. You’re a Lead Writer in The Writers' Block. What do you do and what is the experience like? I share my experience as a writer with the children and young people who visit, the sorts of activities I use to help me to generate ideas and develop them into something someone is going to want to read. I share my notebooks and my workings and demystify the writing process, as the process of writing a short story or a novel is so often hidden away and doesn’t get talked about as much as the skills of writing. Of course, we do lots of writing activities, but also drama and talking activities, and one of the things I’m really keen on is getting the children to share their writing, so hopefully by the time they leave, they have an idea of how useful a community of writers can be. Could you share with us an anecdote of a great day in The Writers’ Block? There are tons, though this one really stayed with me. With one of the schools I worked with, there was a boy who told me when he arrived that he was definitely not a writer and that it wasn’t really going to be for him, almost as though I shouldn’t bother because he wasn’t going to. I worked with him and his class over five sessions and watched him grow in confidence over the weeks and it wasn’t long before he was sharing his writing with the other children in his class and reading it out when we shared our writing. When it was time to leave, at the end of the five weeks, he broke down in tears and asked if he could still be a writer even when he wasn’t in the Writers’ Block. I was amazed at just how powerful the experience of writing was for him and how far he’d come in such a short space of time, as well as what confidence can do. He began to believe that he could be a writer and that was what made all the difference. What is the importance of The Writers’ Block in Cornwall? There are writing centres in many other parts of the country, but we haven’t had a dedicated writing centre in Cornwall before (as far as I know anyway). I know from the popularity of the sessions we offer that it’s something that is in demand, and what I hope it can do is engage children and young people and their teachers in authentic writing practices, in the enjoyment of writing, and in exploring their identities as writers. It’s important in that we share good practice in writing widely, we help everyone to understand they can be a writer, and that has to be important in a world in which if you’re not literate, you’re at a huge disadvantage. What would be your main advice for young writers? It would be pretty much the same as my advice for adults. Carry a notebook everywhere and write in it whenever you overhear something interesting or you have an idea that could become a story or a poem. Be playful with your writing – the more you enjoy it, the more you’ll write and the better at it you’ll get. And above everything else, read, read, read – reading gives you models for great writing, expands your horizons, your vocabulary, your sense of what is possible. We are in with a chance of winning £50,000 of lottery funding through The People’s Projects, but it’s all down to a public vote! We need to get as many votes as possible between now and midday on 15 April. It is wonderful to watch children who arrive with their heads bowed, believing they can’t write, learn to use their new skills and then volunteering to share their writing with the whole group. £50,000 is more than a third of our annual income, and it would mean we could work with loads more children and young people in Cornwall, and also get The Writers’ Block on the road and open our doors to more people in our community. We are a small charity that can make a big difference, so please help us win this funding! Don’t forget to vote and help The Writers’ Block secure funding to continue to help children, young people and families develop creative writing skills in Cornwall.